ZISA, ICT Communication Never Stops! To providing customer better service is the key how can make ZISA survive. The demand from customer is the power to push ZISA keeping growth and development. Steady solution, better development, Value-added service constructed ZISA Value standard. To win customers respect and trust, ZISA keep passion,devoted into all the ambition and energy to help our customer and partner to create more benefits and decrease the unnecessary cost. Digging into all the details, ZISA raise our service level to make things perfect. ZISA pay lots of patience to help our employees and partner to grow up. ZISA believed, with the trust and honest, keep patience and long time perfect cooperation that is cornerstone for ZISA can be continue. ZISA is an open-sharing company to encourage all teams and partners to share the successful story and lessons. Share more, Gain more! 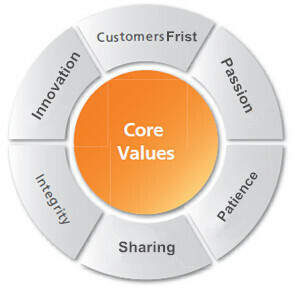 ZISA will be honest to all of our partners, customers and ZISA employees, which is the base stone of developing. The most important thing is treating customers honestly and gettingcustomers’ trust. Keep innovation, to make ZISA a robust and young team, with passion and ambition. Renew everytime.